18 Healthy Vegan Soups, Soups withouts Cheese, Butter, Milk. Soups can be had as an appetizer before a meal or a snack. Soups are loaded with vegetables and are therefore very nutritious. 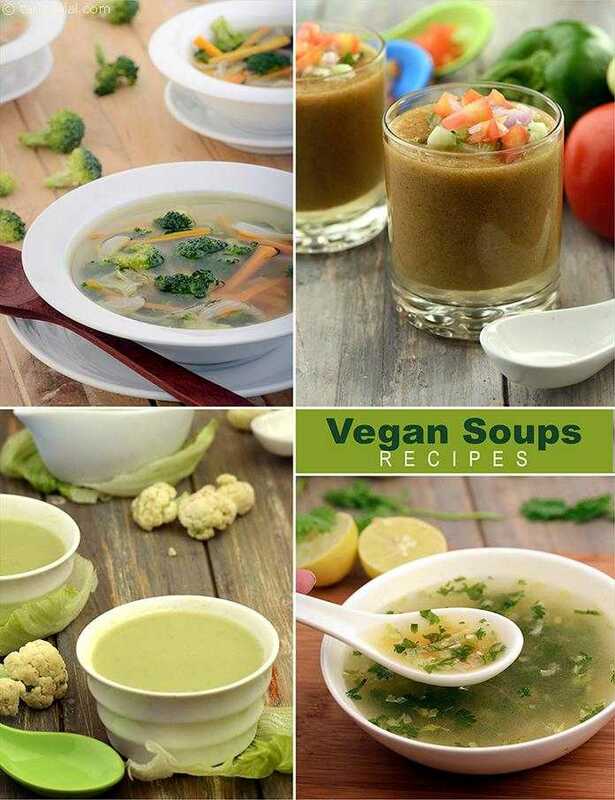 We have selected a variety of soup recipes that are 100% vegan and do not contain any trace of non-vegan ingredients like milk, paneer, whey, butter, cream or cheese. A wide range of soups are available to choose from. We have recipes from clear soups Mixed Vegetable Clear Soup to chunky ones Tom Yum Soup and One Meal Soup too. Apart from Vegetables, this section has a wide range of soups using cereals, dals and pulses too. Do not miss out on delicacies like Whole Masoor and Chawli Soup, Minty Vegetable and Oats Soup etc. And of course we have a cold soup, Gazpachoto beat the summer heat too. These wide selection of soups are sure to please your palate.